I should have warned our sink about Cody. Cody has crazy amounts of facial hair and has to shave on a regular basis for work. Cody just happens to be missing the gene that causes him to wipe his whiskers out of the sink. Bummer really, because it leads me to scrub the living daylights out of the poor sink, whatever caulk it had and frankly the sink and I don’t have a very healthy relationship. So after a crazy session of husbandly shaving I cleaned the sink. Well, after I solved one other little problem. If there were such a thing as sink therapy my sink would be sending me the bill. So after unclogging and scrubbing I patted myself for a job well done and planned on watching a little TV. The sink had other ideas. OH REALLY? And what do you expect me to do about it? CAULK YOU? Seriously? With the gun and the time and the 24 hour period and the money and the waste and I DON’T CAULK. Okay. I see your point. So maybe a little caulk wouldn’t hurt. I just wish there were an easier way to do it. Okay sink, maybe you win this time. I’ll start scraping. Well say! That was pretty easy. HEY! I’ve never caulked before. I think I did a decent job. Now quit with the nitpicking and tell me how you really feel. That’s right you do. And you look better too. Now say thank you to Mr. Caulk Single. 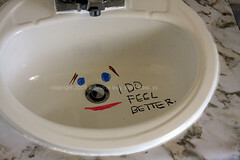 Your sink’s little face just made me happy. 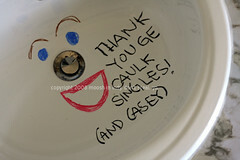 Casey, Casey, Casey, you bring humor to caulking. My mouth is gaping open at the genius that is you. If only we had known about the Caulk Singles. I once came home to find my husband had put the caulk in a ziploc baggie, cut of the corner and squeezed it out because the caulk gun broke. I suppose he thought he was McGyver or something. oh you do have MAD caulking skillz!!!! ali’s last blog post..sometimes classics are classics for a reason. you hear that, Hasbro?? You’re caulking, too? I’m redoing my tub. Bigger job than those singles can do, but that’s why there’s bigger tubes that still don’t need guns. designHER Momma’s last blog post..Are you raising an Atticus or Ella…. YAY! Good job! I can’t handle the whisker ring. It will seriously make me throw up if I have to brush my teeth in a sink with even a single whisker. I don’t pronouce the L in caulk. Makes fixing up the house lots more fun. Down here we pronounce it the ‘wrong’ way. It’s fun. I wonder what he would say I do that grosses him out? Well I feel lazy. I just call maintenance to do stuff like that. Your sink and my sink can totally go out for coffee some time! They’d have some things to talk about! badgermama’s last blog post..Secret texting at the school talent show! There’s hope for my tub yet! mommypie’s last blog post..The crazy woman in the drive-thru lane … that would be me. Mel’s last blog post..Just a few of my favorite things. . .
you just cracked me up! that was great…an ingenious idea! we get whiskers in the sink here too. it is gross. it does drive me crazy. but i think i would rather him shave than actually grow the beard so i deal. You give me great hope! I went and bought some caulk over a year ago, and have been to afraid to use it, you know being a “virgin”. I will follow in your brave footsteps and get the tubs caulked. Amanda’s last blog post..what has brought you in today? Ok, seriously one of the funniest things I have ever seen/read. I would not even attempt such a feat much less do it in a witty creative way for the blogging world to witness. You are awesome! I love your blog more every time I visit. Once again, I’m just sad I didn’t think of it first. So clever! My husband lacks the whisker wiping gene as well. Yuck. Now do they sell the singles in colors? If so, I am so. I might take on this challenge myself. You’re too funny! We bought clear caulk; goes on white, dries clear. I love it. I too have the sink ring. I refuse to clean it up. It’s a principle thing. Or a principal thing. I can’t remember. Kristin’s last blog post..Oh, hi. Casey – I love that you used your child’s bath crayons. 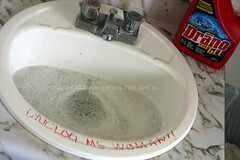 lol And did I mention my hubby’s sink looks just like yours? It’s totally gross…and drives me nuts. Are there any self-cleaning sinks? Okay. Funny post. 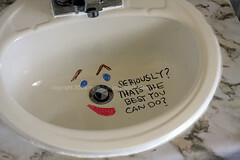 Funny talking sink too. good&crazy’s last blog post..Blogroll revisited. lmao…the pictures and added commentary are HISTERICAL…I love it and good job! staciesmadness’s last blog post..Happy Birthday to my BESTEST friend EVA! 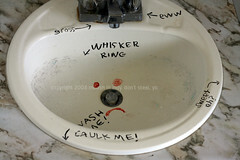 What is it with men and the getting of their whiskers all over the blessed bathroom? And why does it always seem to happen RIGHT after I spent time and energy cleaning it? I think they have shave-dar. SO clever!! I hope you win! P.S. know the feeling about hubby’s hair in the sink… that is one of my BIGGEST pet peeves. Thank God there was a contest, because I was beginning to wonder, “Is this woman losing her mind; doing all that for a blog post?! Too funny. Loved it; especially the title. Good luck! You are officially too cute, too funny, to creative…to be my best friend. I can’t even compare to you. I loved talking to you the other day. Thanks a bundle I needed it BAD. Kim’s last blog post..I promised funny. so, my friend Nicole has a link on her blog labled “the moosh.” My little girl is named “the moosh”…well her real name is “the smoosh,” but we call her “the moosh” for short. Anywhoo, I was curious what another moosh was like. Turns out she’s absolutely scrumptious. And I’ve spent the last week reading every blog entries from the beginning of the year, and a few older ones, and I’d like to thank-you for the amazing ab workout that I got while laughing. 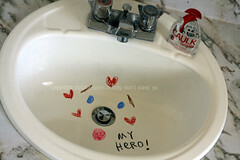 Who just writes messages to themselves on their sink? Holy crap I’m in love with you! thanks for blogging. ps: you are a gifted photographer! Fantastic post! Cute, creative, and informative. 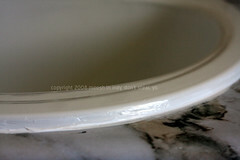 I wish more people would take care of caulking around their sinks and fixtures. Very cute. 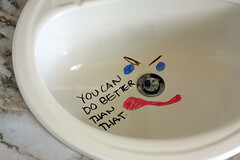 No wonder you and your sink have such a great relationship. If it wasn’t nearly 11:00 I’d be on my way to Home Depot right now. Adria Shas last blog post..We are out of the Induction phase! Awesome. I hope to God my bathtub doesn’t begin talking to me. 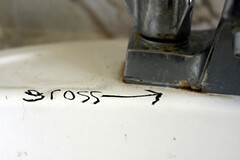 If it is anything like the toilet, the French accent and the self-righteous attitude is enough to drive a person batty. Congrats for winning. Mandys last blog post..Is it ok if I don’t care if I’m destroying the Earth? Why do YOU have to clean up after a grown man? He should clean up after himself; he’s not a kid.